Last weekend, LucasFilm's Star Wars spin-off Rogue One: A Star Wars Story set the box office on fire with a whopping $155 million opening weekend, which puts it in a great position to dominate the box office throughout December and well into the new year. This weekend, however, it will face much more competition than its opening weekend, when it only faced the under-performing Collateral Beauty, with three new movies opening tomorrow, Universal's Sing, Sony's Passengers and 20th Century Fox's Assassin's Creed, with 20th Century Fox's Why Him? opening this Friday. Despite this influx of new competition, Rogue One should have no trouble staying the course, and winning for a second weekend in a row with $87.3 million. This $87.3 million prediction represents a 56% drop for Rogue One, which is par for the course for a blockbuster of this size, especially heading into a crowded holiday frame. This stand alone Star Wars adventure, set between Revenge of the Sith and A New Hope, will likely still have the widest release of any movie in theaters this weekend with 4,157, with Box Office Mojo reporting that Sing is expected to debut in roughly 4,000 theaters tomorrow. 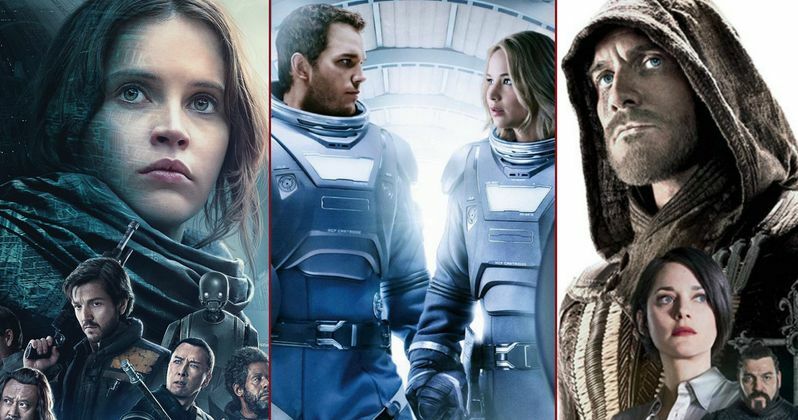 Passengers is expected to drop in 3,300 theaters while Assassin's Creed is expected to arrive in 3,000 theaters. On Friday, Why Him? is slated to open in 2,800 theaters, but out of the four new releases, it seems only one is a critical hit. Sing, Universal's animated comedy with an all-star voice cast including Matthew McConaughey, Reese Witherspoon and Scarlett Johansson, just to name a few, is currently the only "Fresh" incoming movie with a solid Rotten Tomatoes rating of 76%. Assassin's Creed, which stars Michael Fassbender and Marion Cotillard, is currently sitting at a paltry 19% on RT, while both Passengers and Why Him? have 33% ratings on RT. We're predicting that these four newcomers will round out the top 5, with Sing opening in second place with $46.2 million, Passengers in third place with $21.6 million, Assassin's Creed in fourth place with $19.3 million and Why Him? in fifth place with $13.6 million. These numbers only represent the box office figures from Friday the 23rd through Sunday the 25th, not the mid-week tallies for the movies opening on Wednesday. Set in a world like ours but entirely inhabited by animals, Sing stars Buster Moon (Academy Award winner Matthew McConaughey), a dapper Koala who presides over a once-grand theater that has fallen on hard times. Buster is an eternal optimist-okay, maybe a bit of a scoundrel-who loves his theater above all and will do anything to preserve it. Now facing the crumbling of his life's ambition, he has one final chance to restore his fading jewel to its former glory by producing the world's greatest singing competition. Five lead contestants emerge: A mouse (Seth MacFarlane) who croons as smoothly as he cons, a timid teenage elephant (Tori Kelly) with an enormous case of stage fright, an overtaxed mother (Academy Award winner Reese Witherspoon) run ragged tending a litter of 25 piglets, a young gangster gorilla (Taron Egerton) looking to break free of his family's felonies, and a punk-rock porcupine (Scarlett Johansson) struggling to shed her arrogant boyfriend and go solo. Each animal arrives under Buster's marquee believing that this is their shot to change the course of their life. On a routine journey through space to a new home, two Passengers, sleeping in suspended animation, are awakened 90 years too early when their ship malfunctions. As Jim (Chris Pratt) and Aurora (Jennifer Lawrence) face living the rest of their lives on board, with every luxury they could ever ask for, they begin to fall for each other, unable to deny their intense attraction... until they discover the ship is in grave danger. With the lives of 5000 sleeping passengers at stake, only Jim and Aurora can save them all. The supporting cast includes Michael Sheen, Laurence Fishburne and Andy Garcia, with Morten Tyldum directing from the original screenplay by Jon Spaihts, which made the Black List in 2007. Through a revolutionary technology that unlocks his genetic memories, Callum Lynch (Michael Fassbender) experiences the adventures of his ancestor, Aguilar, in 15th Century Spain. Callum discovers he is descended from a mysterious secret society, the Assassins, and amasses incredible knowledge and skills to take on the oppressive and powerful Templar organization in the present day. The cast also includes Marion Cotillard, Ariane Labed, Jeremy Irons, Brendan Gleeson}, Michael K. Williams and Denis Menochet. Justin Kurzel, who directed both Michael Fassbender and Marion Cotillard in MacBeth, directs from a script by Bill Collage, Adam Cooper and Michael Lesslie. Why Him? is set over the holidays, where Ned (Bryan Cranston), an overprotective but loving dad and his family visit his daughter (Zoey Deutch) at Stanford, where he meets his biggest nightmare: her well-meaning but socially awkward Silicon Valley billionaire boyfriend, Laird (James Franco). A rivalry develops, and Ned's panic level goes through the roof when he finds himself lost in this glamorous high-tech world and learns that Laird is about to pop the question. The supporting cast includes Megan Mullaly, Griffin Gluck, Cedric the Entertainer, Kaley Cuoco, Adam Devine, Casey Wilson and Andrew Rannells. The top 10 will be rounded out by Moana ($6.1 million), Office Christmas Party ($4.8 million), Collateral Beauty )$3.6 million), Fantastic Beasts and Where to Find Them ($2.4 million) and Manchester-by-the-Sea $2 million. It's worth noting that Paramount's Fences is slated to expand nationwide on Christmas Day, but it isn't known how big this expansion will be, so we're not putting it in the top 10 at this time, but it's very possible it could bump one of these movies out. There are also a number of highly-anticipated films opening in limited release, such as Lionsgate's Patriot's Day and IFC's The Autopsy of Jane Doe on the 21st, followed by Focus Features' A Monster Calls and Paramount's Silence on the 23rd, with A24's 20th Century Women, 20th Century Fox's Hidden Figures, Warner Bros.' Live By Night and Sony Pictures Classics' Toni Erdmann all opening in limited release on Christmas Day. Looking ahead to next weekend, there are actually no new movies opening in wide or limited release on December 30, although Bleecker Street's Paterson and GKIDS' Ocean Waves arrive in limited release on Wednesday, December 28. In the first weekend of the new year, Screen Gems will make Underworld: Blood Wars the first movie of 2017 on January 6, with A Monster Calls set to expand nationwide on that date. Take a look at our projected top 10 below, for the weekend of December 23.